I am so grateful that I have the opportunity to teach your children. They have each captured a piece of my heart! Did I Hear Someone Say Snow? Did you know that a year ago on November 18th we had our first snow day of the 2014-2015 school year? I hear that we may receive our first significant snow fall of this year on Saturday! Tell your children that Mrs. Lannon said their homework is to shovel the driveway! If you do convince someone to shovel, send me a photo! This week in Reading Workshop we have continued to build our theories about our main character. We discussed characters motivations and struggles. Students learned the “Somebody…Wanted…But…So” format to talk about characters. We discussed what it is that motivates our characters, what it is that their hear really wants, what obstacles get in their way and how they use what is inside of them to overcome those obstacles. In Writing Workshop we had a mini-essay bootcamp and flash drafted an essay about why we love ice cream. Students then began generating ideas for their own opinion essay. We began with a few free writing exercises and learned how to write long and strong about one idea. We also learned how essayists push their thinking to dig deeper into their big ideas. During Math we took our Multiplication Unit 2 Test. Many students did very well! We also began to learn the steps to long division. We started with learning the place value sections method to show students what they are actually doing when the do the short cut method. This is the why and the how of it. I will post the video here for you to watch. Then have your child show you the video that they made and see if they got the process correct. Students also worked in pairs to create a place value sections method video for long division, with partner 1 explaining the steps that partner 2 used to complete the problem! In Science we are wrapping up or States of Matter unit. We learned about phase changes this week (changing from solid to liquid to gas etc.). We also spent a few days reviewing for our Science test on Monday. your child brought home a study guide and flash cards on Wednesday to study for the test. Wait! was that snow that just brought my class to a screeching halt?! Of course when the first flakes of the season are possibly spotted, we all have to run to the window to watch! I love the excitement that our children find in the little things! This week in reading we have continued to focus on growing theories about the characters in our “Just Right” books. Students have learned that the theories that we develop early on need to be flexible. As we read on our theories may change or grow, (In The Tiger Rising Rob seems weak at first, kind of wimpy. As we read on our theory changes and we begin to think, he’s not really a wimp or weak, he just doesn’t stand up for himself, because he has locked all of his feelings away). Students also compared their character to another person, object or animal. Rob is like a turtle because he hides in his shell. Math has been all about that Multiplying! We continue to work on 2 digit by 2 digit multiplication using the “old school” method. Yes, that’s what we learned in math class ages ago…thus “Old School.” Students have also learned how to multiply 1 digit by 4 digits and have used rounding and estimating as a strategy to check their work. Our math “Practice Test” is today! This week in Science we have continued to investigate the states of matter and we have focused on how molecules are packed and move around in the different states. Students also learned about phase changes, moving from one state to another, the names of the phase changes and what is needed to change phases. Students also began their swimming rotation today. Here are some photos of our first pool session. It sure does seem like this school year is flying by! I can’t believe that we are already through the first week in November! There has been a lot of learning going on in room 16 this week! In Reading Workshop we have been continuing to study characters. This week we discussed how an object that our character holds close to their heart can reveal things about the character (Rob’s carvings are important to him because his mother taught him to whittle, this tells me that Rob misses his mom and the carvings help him remember her and feel a little less lonely). We also learned that looking at how the other characters treat the main character can reveal information about the main character (Rob lets the Threemongers pick on him, Sistine picks on him in the beginning, this makes me think that Rob doesn’t is weak, vulnerable, he doesn’t stand up for himself and he is probably lonely). These are great conversations to have with your child when they are reading their just right book at home. This week in Writing Workshop students finished the final draft of their Realistic Fiction stories and then had an “On Demand” writing piece to show all that they have learned in our writing unit. Students also began to learn about Power Paragraphs. A very formulaic type of writing that helps us to write great paragraphs for essays and informational pieces. In Math students have been learning different methods for multiplying double digit numbers. Students have also learned the “Short Cut or Old School” method. This is the method they will need to master to be successful in 5th grade math. Please make sure that you are checking over your child’s math homework and helping them identify an problems the have solved incorrectly. We will have Our Unit 2 Math test next Friday, the best way to prepare for this is to know your basic math facts, know how to draw an area model and be able to solve a variety of multiplication problems using the shortcut method. This week in Science we have continued to explore the States of Matter and have investigated solids, liquids and gases. Ask your child to share with you some of the experiments that we have done and what they have learned about the three states of matter. 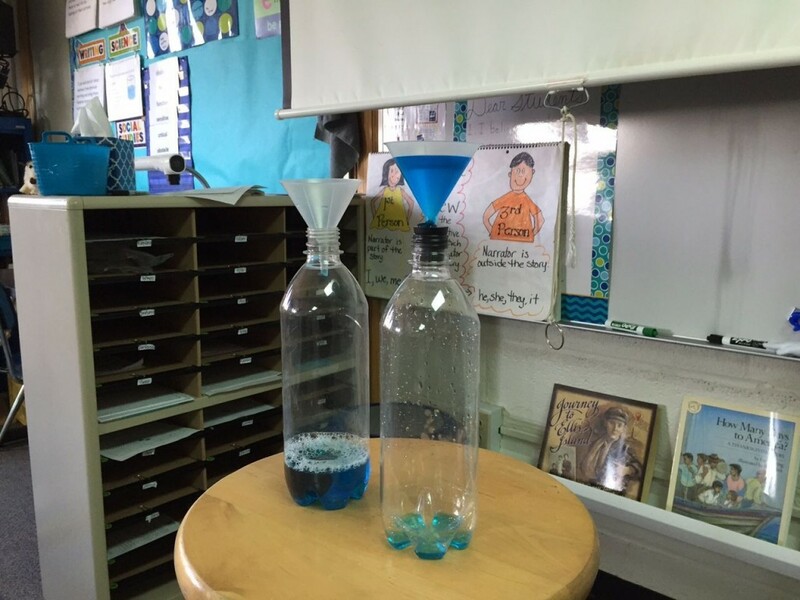 Here is a photo of our investigation about whether or not gas takes up space (has volume). Mark and Somer Sheridan, Parents of current Spring Lake students created this amazing drone video capturing Spring Lake Public Schools from the air!